"25, weiblich, ledig, blond sucht…"
Originally written by Isolde Scheurer on December 1st, 2005. In today’s backstage article I get to say my part and will tell the readers how the world of Broken Sword 2.5 is inhabited by the most curious, interesting, helpful, but maybe also annoying people – because what is a story without all the many small supporting roles? However, what you’ve seen on our website until now, isn’t made by my hands… pencils, except the avatars of André and Nico. The reason for this is that I didn’t join the group until 2003. Since that time, I have created 23 characters (I will explain in a moment what that means exactly) and have also redesigned three original Broken Sword characters. Our animator Bernd Bachmaier has also done some of this work, but I have done most of it. I cannot say exactly how many hours I put into this project every week, because -for example- I do most of the sketching in front of the TV. After that, I do the colouring in one go on the PC and after that I immediately place the characters in the backgrounds. That’s also the reason why I often wait until new backgrounds are done, because without them, I can’t start drawing. I have to place the characters in a suitable pose for the backgrounds. At the moment I’m thinking about the next character. There is a character list (which I’ve mostly created myself), so that I no longer have to look everything up in the script. On this list I have written certain traits for each character which in my opinion go well with those characters. This way, a character becomes more than a couple of coloured lines and some dialogue in the story. It is also a lot of fun to come up with a ‘life story’ for every single character. I can illustrate this best by giving an example which you can find back on one of our screenshots: the family in front of hotel Ubu of which I luckily still have a few stages of their design. It was important that the family would be rushing past the hotel. 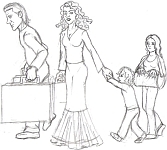 The reason for that, I cannot tell you :P. The only thing that I knew before I drew them was that they had to be close to one another, that they had to carry suitcases and that the family should consist of a mother, a father and two children. So far so good. “What does a family like that look like?” I asked myself. 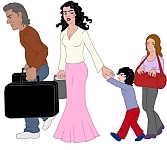 The father could, rather cliché, carry most of the suitcases, while the mother was having difficulties to drag the children along. And so, the first sketch was created (see image), wherein I only gave the mother a skirt because I rarely get to design female characters with beautiful clothing and rather like to design clothes. I said to myself: “Why not a well dressed family?” :p. Most of the time I only need about one or two sketches to create the features of a character the way I want them to be. As a result, an eraser is of great use to me. The second stage of the process consists of scanning the image into the computer to brighten up and colour in the sketches in Photoshop, so that the new lines can be distinguished from the old ones. Then the file is converted into PSD format onto which I place a new layer. In this layer I draw over the lines of the first layer and then I colour in the surface. Back when I didn’t have a drawing tablet, I used to copy the sketches with a fibre-tip pen and would then scan them into the computer as ‘lineart’. I would always need to touch up those pictures in Photoshop, because the scanner never got the colours exactly right. But I like the method that I use now better, because it is less of a ‘pixeljob’. Anyway, as you can see in the image, I use the pencil-tool after which I fill in all the surfaces with the bucket-tool. When you don’t understand any of this… I also have a small tutorial on my Deviantart site. ;) After this everything still has a very pixel-like look, but when everything is scaled down to 15 percent for the background, nobody will notice anymore. After the shrinking, only the background needs to be added and the colours need to be adjusted. And behold: my work for the day is done. Usually, the colouring takes the longest, about 2 to 3 hours per character, because my drawing tablet is unable to produce clear straight lines. And then our animator takes over, who by the way rarely keeps to my original choice of colours :). My work on this project is pretty much a dream job for me. Even when many of the characters only have one or two lines in the game, every single one of those characters is special to me; an individual even and I hope that the future players of our game will enjoy meeting them. Even when their role is to stall George in his quest and to drive him into madness. Muhahahaha! Just kidding. You can see more of Isolde's artwork on her DeviantArt page.